Planning will lead to deep thinking about company’s goals, strategies. One reason people ask if you have a business plan is because they don’t understand your business. You might not care if asked by a stranger, but what if the question came from an employee? You would be surprised how poorly your staff understands why clients keep coming back and buying. Writing a business plan will help you think through all the scenarios you might face during the course of a current business cycle. For example, you might ask, are we at risk of losing any major clients? Is one of our market segments facing a financial downturn? What opportunities are we missing? It also helps to solidify your thinking on potential process improvements, growth strategies and contingency plans. The mere act of writing a business plan will give you a great deal of clarity and enhance your ability to talk about your business to others. You need a business plan because everyone in your organization needs a clear image of what your business is all about. Writing a business plan provides a level of intimacy that can come only through thoughtful reflection and analysis. The kind of deep thinking that will help you communicate what your business is and does succinctly and concisely, in a manner that is compelling and makes people sit up and pay attention. Writing a business plan takes time, thought and energy. It requires focus and commitment. It often requires doing things you don’t like doing, facing realities you don’t want to face, and finding solutions to problems that have no answers. But there is good news. A business plan can be a wonderful recruiting tool for both employees and customers. You can create leverage with your suppliers and strategies for partnering that will take you and your business to the next level. You have answers to the hard questions whenever they arise, and you can react quickly without making foolish mistakes or losing opportunities. You are prepared to succeed. You will come up with some of the most energizing and creative ideas you have had in years for launching a new initiative or marketing campaign. You may come up with new products, services or markets. Bottom line, you will uncover more new ways to make money and increase sales than you have had in the past four years, all from just four hours of thinking and writing. If you do decide to embark on this journey and actually start writing a plan you can use, the first rule is to get something down on paper. Perfection is not the goal, nor do you have time for it. The goal is to stimulate your brain and connect more deeply with your business so you can talk about it more effectively with others. An executive summary that describes your history, products, key clients, market segments and the value you bring to them, your mission, values and long-term goals — and fits on just one page. A financial history and forecast of future performance. If you can get your “new” plan 85 percent complete and accurate, you are exactly where you need to be at this point. Now that you have your plan, it’s time to start reaping the benefits. Start by distributing it to everyone on your staff and asking for input on what should be added, removed or changed. Find out what they like and don’t like, what makes sense and what doesn’t, what they agree with and disagree with. Then make some changes and send it around again. If your staff is looking at the plan and contributing to it, they are thinking about your business in a way they don’t often have opportunity to. Your job now is to get your business documented and create a business plan to use every day for making decisions and keeping your team focused. Share it with your staff and get them involved in making it come to life. Look for people that want to take responsibility for certain components of it and give them a chance to lead. You will be surprised at the results. 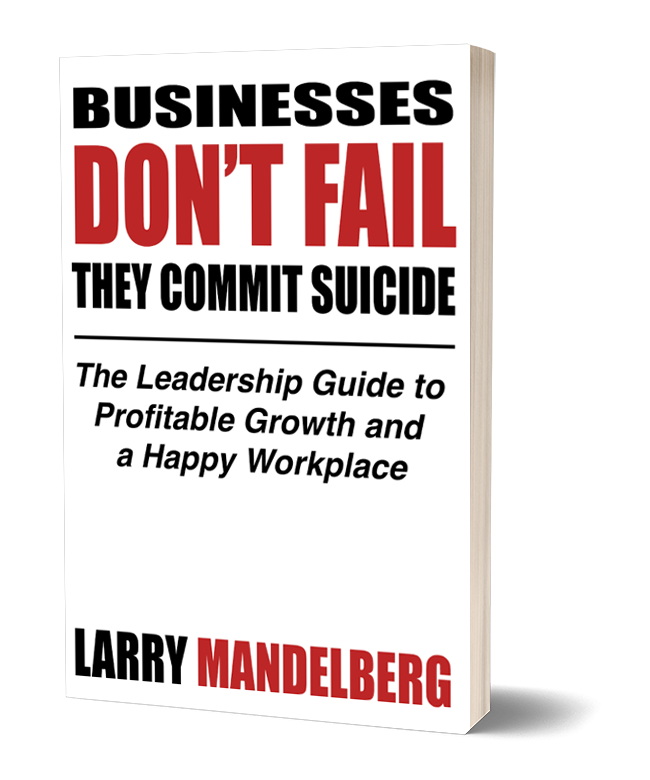 Business Advisor Larry Mandelberg leads the way on how to capture the knowledge and expertise you need for business success and growth. Participating in peer groups and industry associations offer an opportunity to build your credibility and boost your business profile.